Put on a mask, snorkel and fins and venture into the remarkable world that lies beneath the water's surface in and near Melbourne. Snorkelling is a fun and accessible activity for anyone who can swim and breathe through a snokel. 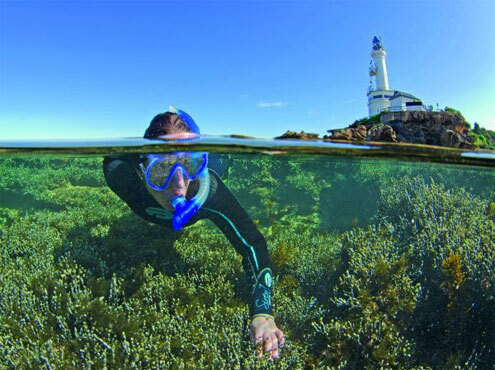 The Mornington Peninsula with its crystal clear waters, sandy shores and sheltered bays make it a safe and an ideal environment for the entire family to snorkel and see firsthand the magic, sheer diversity and colour that abounds. It’s safe to snorkel from Frankston right down to Portsea. The more adventurous might even take on the Back Beaches. The exciting aspect of snorkelling in the waters off of the Mornington Peninsula is that every time you immerse yourself, you are guaranteed to see something new and spectacular. The change in seasons also bring with it new marine life to experience. In winter thousands of spider crabs converge in Port Phillip Bay (see Giant Spider Crabs Melbourne), while in spring and early summer you can be witness to male weedy seadragons carrying their precious eggs on their tails (see Weedy Seadragons Melbourne). The Mornington Peninsula provides an ideal playground for novice snorkellers through to the more adventurous ones. Beginners can snorkel the 200 metre long Octopus Garden Trail with its underwater signs at Rye Pier. Blairgowrie Pier is really good for snorkeling. We suggest you walk to the landing and divers platform abot two-thirds of the way out, enter the water and duck under the sea wall. You'll come up under the pier. Then snorkel back to shore between the pylons of the pier with the sea wall on your left. The sea wall and pylons are covered in colourful sponges, with plenty of fish around. For added fun try a night snorkel adventure, and witness the nocturnal sea animals that come out to play and feed when the sun goes down. All you need is an underwater torch, and many creatures attracted by light will quickly emerge. Rye Pier, Blairgowrie Pier, and Portsea Pier are ideal to see intriguing creatures such as delicate dumpling squid, octopus and garfish. Named to commemorate Queen Victoria's diamond jubilee, Diamond Bay is a sparkling ocean beach tucked away behind several blocks of holiday homes. It has many rock ledges and overhangs, kelp beds, reefs and small walls. In these is a variety of life including the odd crayfish! You'll also find old wives, boarfish, abalone, and schooling fish. Head to Pearse’s Beach, Blairgowrie on the ocean side of Mornington Peninsula. It's a world away from the bustling shopping strips, with sandy trails that connect to even more remote beaches, where the only rush hour is on the waves when the tide's up. Mushroom Reef is famous for its diversity of marine life and has attracted scientists for over 100 years. The intertidal soft sediment is an important feeding and roosting habitat for many birds. When searching the rockpools one can find many crabs, multicoloured cushion seastars, numerous species of snails and delicate anemones. See also, Parks Victoria: Mushroom Reef Marine Sanctuary. 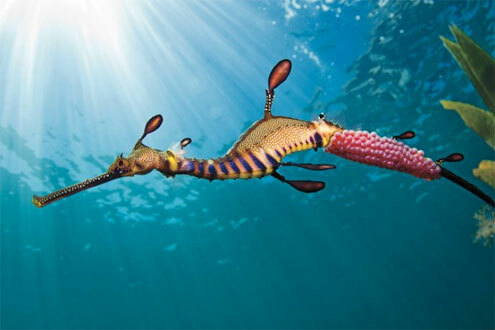 Flinders Pier is the Weedy Seadragon capital of the world! The BBC Natural History Film Unit spent three weeks at Flinders Pier in January 2016 to get footage of Weedy Sea Dragons for Blue Panet II, episode 5, Green Seas. There are dozens of them here and during the right season you might see the adult males carrying eggs around. Weedy Seadragons can also usually be found at Portsea Pier. 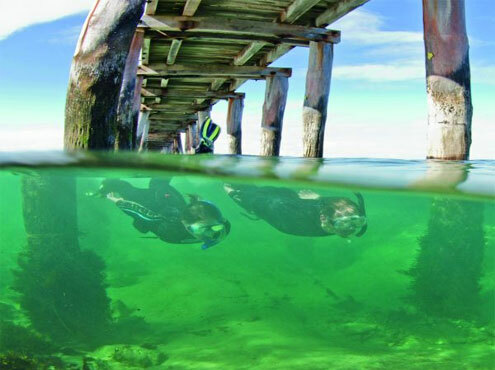 There are many people who think Portsea Pier has been somewhat ruined as a snorkelling site by the Port Phillip channel deepening programme carried out by the Port of Melbourne in 2009. Since the dredging, the swells at Portsea Pier are more frequent and more intense. Indeed, the once lovely Portsea Beach has now been totally destroyed. For more information, please see Weedy Seadragons Melbourne. There are quite a number of marine parks in Port Phillip Bay, along the Surf Coast, around the Mornington Peninsula, and further east too. Most of these are great for snorkelling. One favourite is Ricketts Point Sanctuary at Beaumauris, not far down the east side of the Port Phillip Bay. Some other ideas are: Sandringham Pier, Point Cooke Beach, The Jawbone, and Williamstown. Jawbone Marine Sanctuary, Williamstown is often overlooked and its a great snorkelling spot. Most beachgoers choose to hit Williamstown's humming main beach, but a haven for snorkellers is less than a kilometre away. This forgotten seaside pocket is the closest marine sanctuary to Melbourne CBD, with jellyfish, banjo sharks, sea stars and other underwater critters to be discovered in 30 hectare of protected waters. Chances are you've driven past Kerford Rd Pier, Albert Park, a bayside haven on scenic Beaconsfield Parade but never thought to stop. It's a 15-minute jaunt from Melbourne CBD and has a playground, cafes and toilets nearby, making this an easy snorkelling destination for families. Bunurong Marine Park, Inverloch has a number of great spots to snorkel such as Flat Rocks with its profusion of large rock pools and The Caves which has a large pool opening out to the sea that is accessible at low tide. See also, Parks Victoria: Bunurong Marine National Park. If you're more of an active person that a sunbather, the aptly-named Shelley Beach is about a 90-minute drive down the South Gippsland and Bass highways. Walk past swimmers at the main beach and round the western headland for a private slice of paradise, complete with rockpools, crystal clear water and yes, plenty of seashells to sift through for the perfect take-home souvenir. It'll take more than a day trip, plus two hours of trekking by foot before you reach Fairy Cove, but hikers will say it's worth the walk. The undulating 3.8 km walk that leads to the anatomically named Tongue Point from Darby River will get the heart rate up, but it's this tiny secluded bay that's worth stopping at for a refreshing snorkel. At low tide, you'll be able to swim over to its neighbouring cove, which is so secret, it doesn't even have a name. Display a Dive Flag: You should display a dive flag at all times to ensure you're visible to all water craft. Be aware of 'boating zones', and any other areas where boat traffic is likely. Never Snorkel Alone: Always snorkel with a buddy. Stay within close proximity of each other to ensure safety. Consider Conditions: You need to take into account your level of snorkelling experience for each particular site. The depth, tide, currents and wind direction also need to be considered. Never take weather conditions for granted and always check the BoM weather forecast before entering the water. Wear Appropriate Gear: In the colder months you should consider wearing a wetsuit, hood and gloves. The right fins maximise your swimming capability. Short stumpy fins are okay on the surface. You might need longer fins if you want to leave the surface and explore the depths. Don't Touch Stuff: Avoid disturbing unfamiliar marine life. Some of what you'll see is dangerous to touch. Many marine organisms in the area possess venom and toxins which can be lethal. See also, Melbourne Snorkelling Sites. If you don't have your own snorkelling gear yet, or think you need to upgrade some of it, please take a look at our Snorkelling Guides in the Trusted Snorkelling Advice section of this website. 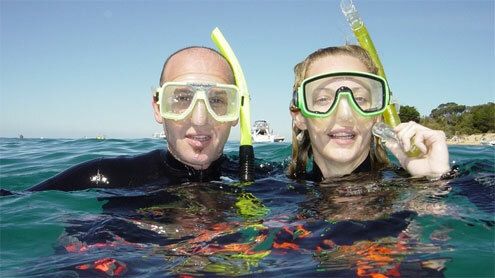 Please also check the great range of Snorkelling Gear in our online shop. Please note: We DO NOT hire out masks, snorkels, fins, dive boots, gloves, hoods or vests for snorkelling.